I’m a big fan of flexible farm rent contracts. In my previous blog posts, I’ve mentioned that there are two opportune times to negotiate a flex lease contract. While we might not be in a period of abnormally low prices when looking at the last 20-30 years, we are definitely faced with relatively low prices when compared with the trading range of the last 7-8 years. 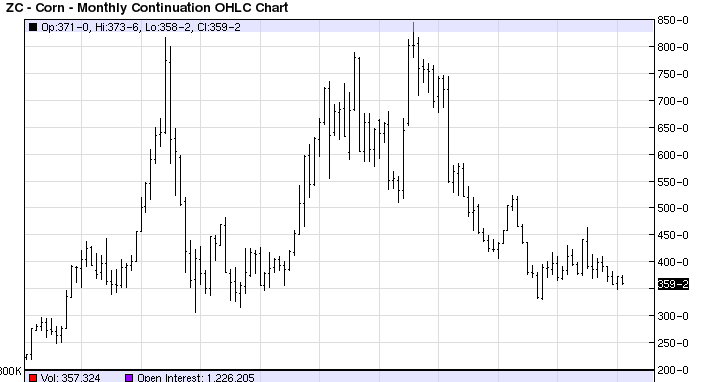 See below for a 10-year chart of corn prices. Going back to 2007, we are trading in the bottom 10-20% of the price range. In a commodity-based business, low cost producers (on a per unit basis) typically survive and thrive. A big component of a farm’s cost of production is its land cost (obviously). In today’s price environment, farms should be working to lower all costs. Land costs need to be looked at closely. It’s not easy to lower cash rent. Landlords often focus on past prices and past profits and its hard to blame them. They are in the business of maximizing the return on their farmland investment. At the end of the day, we’d all like price and profits to increase but we have to deal with what is in front of us today. We are in a low price and low margin environment and land costs are slowly starting to reflect that. While the majority of land rent that I know about has stayed the same, I personally know of 1,000’s of acres of land rent that has been lowered this winter. While the amount of each decrease varies dramatically, I’ve seen the average decrease come in at approximately 10%. After years of high prices, is it fair for a landowner to accept a lower cash rent? That’s an impossible question to answer. What we do know is that the low cost producer will be in the best position to survive this downturn and thrive during the next cyclical return to higher prices. I’ve seen cash rent decreases of 20%+ that have been negotiated in conjunction with the implementation of a bonus structure for the landlord when (not if, in my opinion) when we return to a period of higher prices. Every farm should be working with their landlords to try find a mutually-beneficial way to lower land costs. The easiest way to accomplish this (in my opinion) is to work to convert the cash rent contract into a flex rent contract. See below for a realistic example. In this situation, it would be prudent to ask for a decrease in the cash rent in exchange for a price-based bonus. Here is what I would offer. This is an example of a fixed bushel-based bonus structure. The only variable is the price. There are are a few reasons why this can be better than a revenue-based structure that also includes a yield variable. 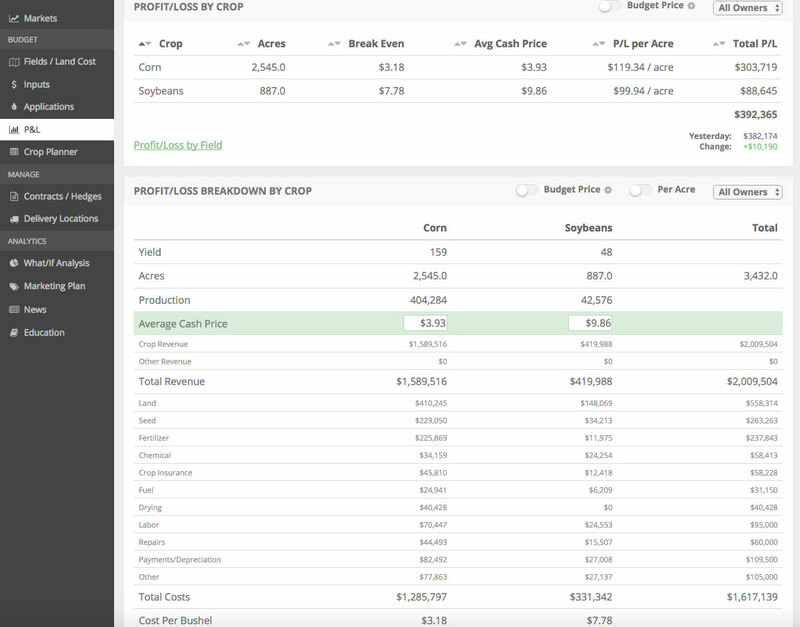 You need to be able to make the best possible decisions for your farm as a whole. As an example, sometimes you are forced to plant a field later than what is optimal because you’re busy getting your fields planted on the other end of your farm. A fixed-bushel lease keeps the incentives aligned if you are forced to make a decision that neglects a certain farm/farms. Landlords have no reason to question your agronomic practices with this type of lease. Here are total rent amounts for corn in the above structure. Here are total rent amounts for soybeans in the above structure. We are in a period where some cash rents need to come down in order for farms to weather this storm of low prices. Now is the time to propose a flexible rent contract with your landlords in exchange for a lower base cash rent. A lot of landlords prefer a fixed cash rent but its your job to at least make an effort to convert them. If the contract stays in place through the next period of high prices, they’ll likely be a proponent of flexible leases over the long-term. There are infinite ways to structure a flex lease. Find one that works for both your farm and each of your landlords. If you are interested in content similar to this blog post, sign up for our free newsletter below.